As the leading voice in Golden Rule Dialogue, Dr. Clyde Rivers is bringing the Royal Law to the world. Dr. Rivers explains, "While many view the Golden Rule from a religious perspective, it is actually revealed as a Royal Law in scripture. It is a law based on governance, not religion." The leader of the Global Golden Rule Movement is building a Royal Law platform that is based upon the sovereign King perspective of God, which can be seen in the Bible where it declares in Psalm 24:1, "The earth is the Lord’s, and all its fullness, The world and those who dwell therein." Dr. Rivers insists that this bible passage clearly shows that God is King, Lord and Ruler over the earth, the whole world, which includes all that dwell therein. God is King and He established a Royal Law by which mankind would be governed. No matter what one believes about God, or even if there is no belief in any divine entity, most people will agree on the Royal Law. It's not a religious law and it carries more weight than a cultural code. "It is amazing that all of the major religions of the world agree on this one ethic: Treat others the way you want to be treated. Love your neighbor as yourself," concludes Dr. Rivers, "As I travel around the world and see various nations or communities in conflicts due to racism, tribalism, sexism, and many types of divisions, I see all of it rooted in one single law that is being violated: They are violating the Royal Law, the Golden Rule." As Dr. Rivers is called into communities or nations to mediate or expedite peaceful solutions, he finds that he is able to bring the keys to peace and development through Golden Rule Dialogue and the promotion of the Royal Law. 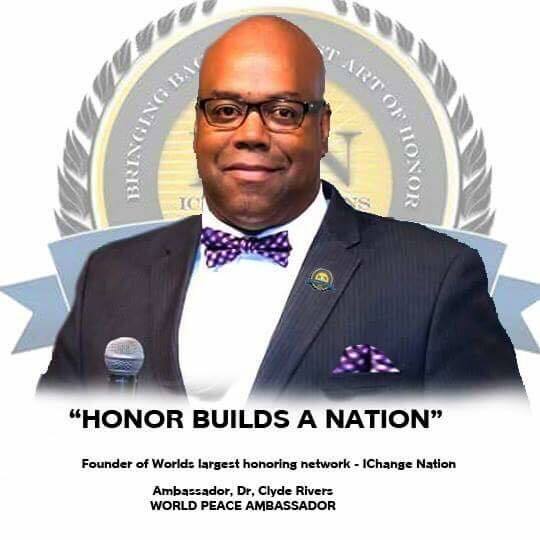 Golden Rule World Peace Ambassador, Dr. Clyde Rivers, is the Founder and President of iChange Nations™ as well as the global Golden Rule Dialogue Expert. Dr. Rivers travels around the world promoting Golden Rule Dialogue in the developmental process of finding peace through dialogue. The Golden Rule Dialogue is simply, “Treat others the way you want to be treated in your dialogue.” Dr. Rivers' motto is, “Listening for Change.” He believes every life is valuable and created for a contribution to our world and that without peace, that contribution is lost and our entire world loses. iChange Nations™ is also a professional institution that builds Statesmen by equipping, mentoring and training highly esteemed individuals who have the desire to change nations throughout the world. The organization is seeking to bring global awareness by strategically helping nations to educate, train and support a Nation Building Process that is designed to improve the dignity and betterment of human life. This international platform focuses on establishing effective relationships; to help people understand the value of honor and basic human rights. 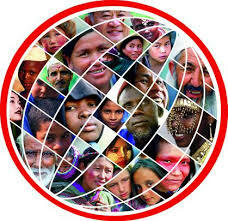 iChange Nations™ is the World’s Largest Honoring Network Establishing Cultures of Honor around the world. ICN has established a system that is bringing back honor to the world. They look to honor people at global, national, state and community levels, that have made positive contributions in helping mankind. It is no wonder that Golden Rule Dialogue and honoring others are going hand-in-hand to change the world.